JENGbA is a grassroot campaign, check out www.jointenterprise.co to view our work. Kevan Thakrar who has been held in solitary conditions for 7 years is just one of the prisoners we support. JENGbA is a grassroots campaign supporting prisoners wrongfully convicted using the doctrine of 'joint enterprise'. Joint enterprise is used to convict more than one person of a single offence. It is often used in cases of murder. In the case of Kevan Thakrar he was not even at the scene of the crime when 3 men lost their lives, this was accepted at his trial. Since his conviction he has been held in various Close Supervision Centres (CSCs) throughout the country for 7 years. CSCs are, in Kev's own words, "the English version of American supermax prisons, indefinite solitary confinement within the most oppressive and brutal environment found in this country. Psychological warfare is used upon its victims on a constant basis, with frequent physical attacks supplementing the arbitrary punishment." As only around 50 prisoners fall victim to the CSC at any one time its existence is largely unknown even amongst the general prison population. JENGbA now wants to raise funds for Kevan to have an urgent psychological assessment, which will prove vital in proving that it is more damaging for him to be held in the CSC than the main prison estate. 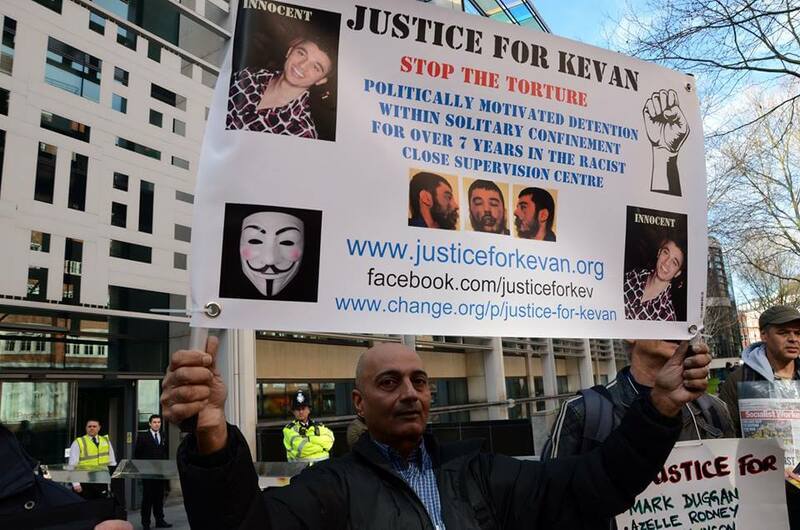 This is not only for Kevan, we are hoping that once we raise enough funds to enable Kevan and his family to move forward and get him an urgent assessment, we will also be helping to bring this barbaric punishment regime into the public arena and help others in the same unfortunate circumstances. Kevan's lawyer, Dean Kingham, says "Long term solitary confinement can have long term adverse effects. It is well documented that progression within the CSC system is limited and there is very little of it. Progression out of the CSC system is rare and difficult to achieve. The system is often viewed as lacking legitimacy, transparency and has a long term adverse psychological impact on it's residents given its lack of independent scrutiny or external involvement in decision-making. The longer term potential for psychological deterioration due to the lack of meaningful activities and very nature of the detention is very real. We are seeking to obtain an independent psychological assessment to ensure that there is transparency, legitimacy and Mr. Thakrar can progress". Legal Aid is available for psychological assessments of prisoners and Kevan's lawyer has applied. But the delay has been so long that we feel now it is vital that the assessment takes place before his health deteriorates further. Seven years in solitary confinement is an unusual and inhumane punishment for any prisoner, let alone a man who continues to maintain his innocence. If you can reach out to help Kevan, with any contribution no matter how small, it will be used directly for his assessment. Thank you for taking the time to read this, if you are unable to help financially at this time, please spread the word and let people know that these places, with their concrete beds and chairs, actually exist in English prisons. 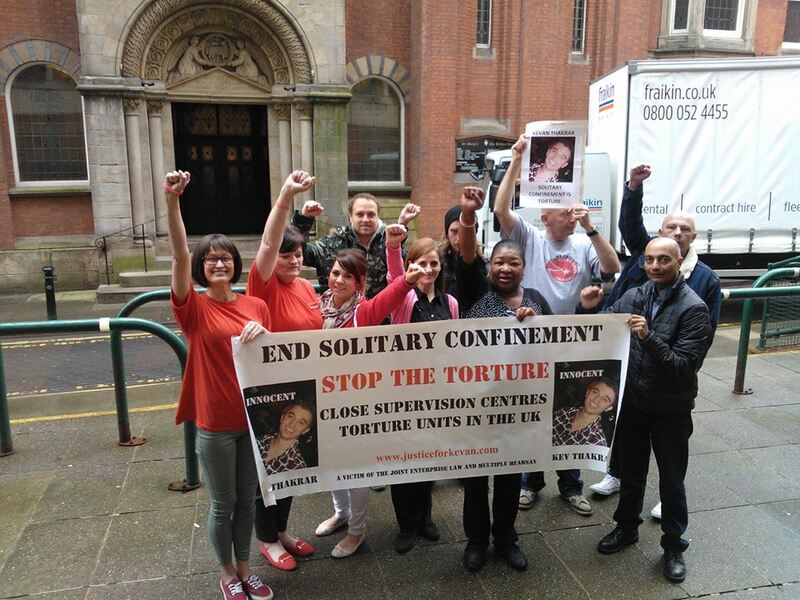 Family and friends demonstrate outside Manchester Prison where Kevan was held (above) and, below, on a recent march in London where they were joined by hundreds of supporters. Good luck with your cause and I hope that justice comes your way very soon. 7 years is inhumane lets make a wrong right.